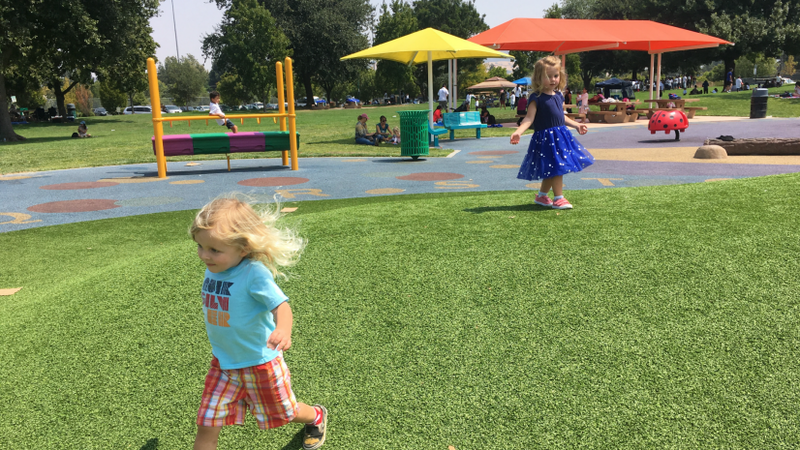 First, understand how Collector worked: it opened a map of parks, and that map contained layers of things to capture in the parks: single places (like the picnic table you captured), lengths (like the sidewalk), and areas (like the playground). Each layer defined the information that could be captured in the form, and the map was used to configure the form. 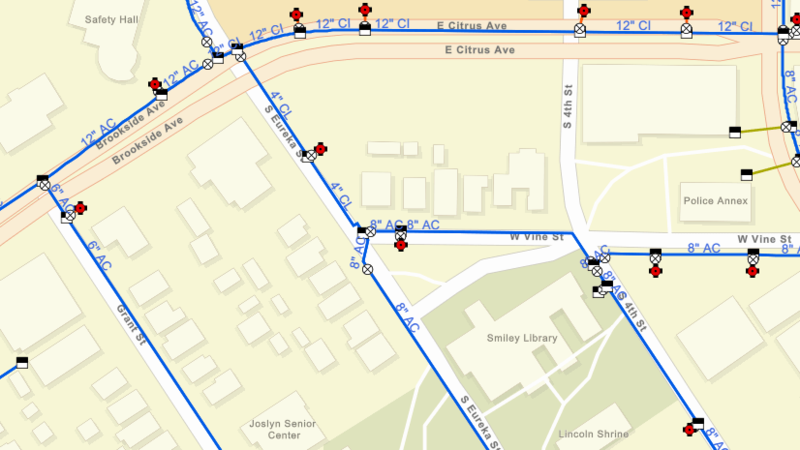 ArcGIS Online and ArcGIS Enterprise provide templates you can use to jumpstart your layer. In ArcGIS Online (coming in ArcGIS Enterprise 10.7) there is a template that lets you define all aspects of your layer, and that’s what we’ll use to recreate the Parks map. In these steps, we’ll only configure the Places layer. For extra credit, create the Paths and Areas layers by following the same steps. 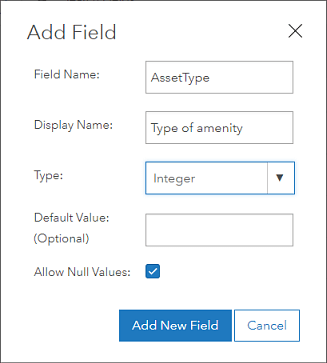 Note: If you are using a version of ArcGIS Enterprise earlier than 10.7, you can pick a different template and create a slightly different layer. A similar one would be the Field Notes template. Sign in to your ArcGIS organization in a browser (ArcGIS Online or your ArcGIS Enterprise portal). 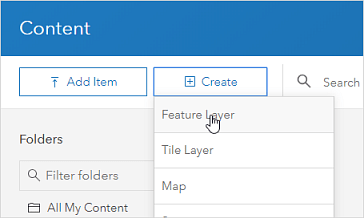 Go to Content, and in My Content click Create and choose Feature Layer to open the Create a feature layer dialog. Select the Build a layer category, select Points, lines, and polygons, and click Create. Click on Point layer and rename it to Places. If you’ll also create the other layers, rename Line layer to Paths and Polygon layer to Areas. Otherwise, you can uncheck them. Click Next. Provide a title, like Parks. 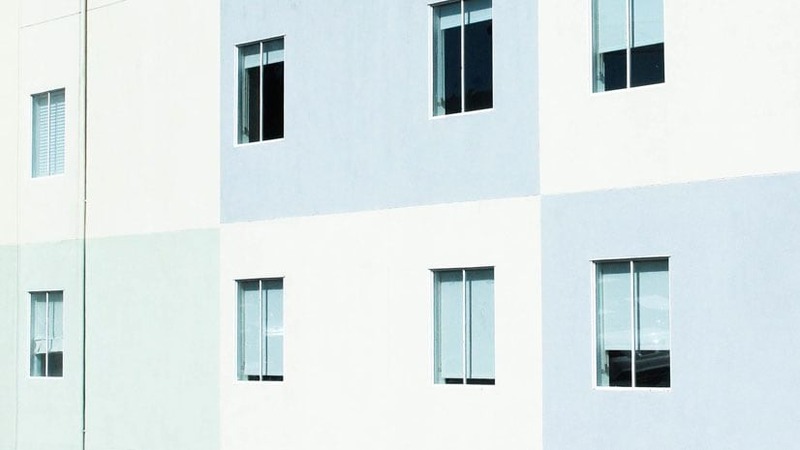 Since this must be a unique name in your organization, you might need to include your initials if others have followed these same steps. Click Done. Your Parks layer is created and its item page opens. In the following steps you’ll create the fields that define the form for the Places layer. Go to the Data tab of the item page and go to Fields. If you created layers for points, lines, and polygons, verify that Places is chosen in the list of layers. Click Add. Give a name AssetType and an alias Type of amenity. Choose type Integer – you’ll create a list of choices later. Accept the other defaults and click Add New Field. Click Type of amenity in the Display Name list and click Create List to create a list of choices for the type of amenity. Type a label of Water fountain with a code of 0. Add entries for Restroom (code 1) and Picnic table (code 2). The sample map has more options for the type of amenity—add as many here as you want. Create another field named Notes that is a String. Since you want your mobile workers to be able to attach pictures showing the things in the parks, enable attachments: go to the Overview tab of the item page, scroll to the layers list, and click Enable Attachments for the Places layer. Still on the item page of your layer, in the drop-down list for Open in Map Viewer pick Add to new map to start making your map. Save your map, giving it a title Parks and a tag. In the Contents pane, hover over the layer of places, click More Options , choose Rename, and rename the layer of places to Places. Click Change Style for the Places layer. Choose to show the Type of amenity attribute. Click Options for the Types (Unique symbols) drawing style. 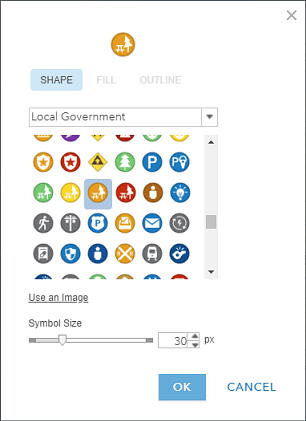 Click the symbol next to picnic table, click Shape, choose the Local Government category, and click the picnic table . Set it to a size of 30 and click OK.
Configure the symbols for the Restroom and Water fountain types, also in the Local Government category. Click OK and click Done. Click Edit, click Manage, and click Save Changes. This creates feature templates that Collector will use as the types of assets you can add to the map. Open Collector and choose the map you just made. Note: Either sign in with the same account you used to make the map, or share the map with a group and sign in as a user that is a member of that group. Walk around your local park, adding picnic tables, restrooms, and water fountains. If you aren’t sure how to add them, see the blog on capturing your local park. Now you’ve prepared and used your own layer in Collector. Think about what assets and observations your organization would like to bring into its GIS, and how you’ll design layers for those data collection projects. For more details, see Design your layer, Prepare your layer, and Make a map. 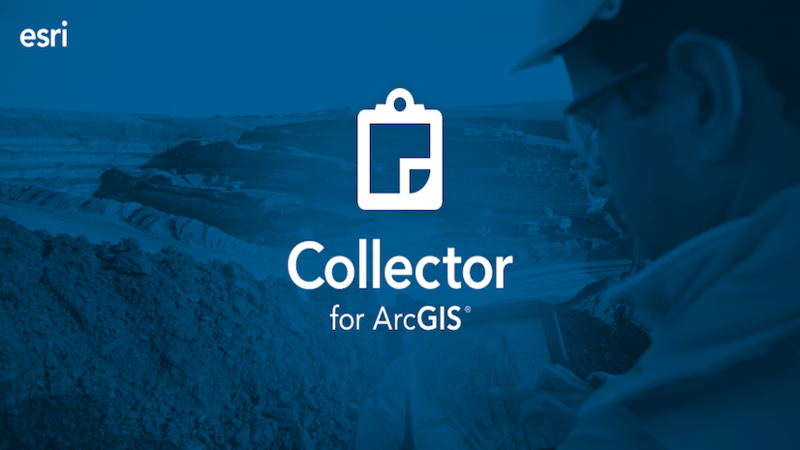 New enhancements to ArcGIS Online make it easier than ever before to make maps for use with Collector.